LISTEN UP, BROTHER! It’s WRESTLEMANIA season at ERIC ROBERTS IS THE MAN, and we’re joined by wrestling expert Matt Hollinger to talk about TWO films where ER pairs with stars from the squared circle. 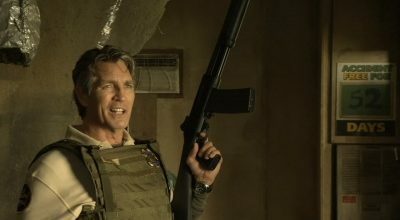 First up finds Eric Roberts re-teaming (briefly) with his EXPENDABLES co-star “Stone Cold” Steve Austin in the 2010 CLIFFHANGER riff HUNT TO KILL. Then there’s THE CONDEMNED II which finds Roberts as the father of WWE superstar Randy Orton in a barely related sequel to the Steve Austin-starring THE CONDEMNED from 2007. Pull out your 24-inch pythons and enjoy! We mentioned briefly at the end of the show Eric Roberts showing interest in appearing in SHARKNADO 3. Send your messages to The Asylum and tell ’em WE WANT ROBERTS. First Lady Michelle Obama received a blue beaded cape from fourth-generation indigenous artist Tammy Beauvais of Kahnawake, Que. Three glass beads on the cape once belonged to the designer’s great grandmother. Beauvais has been designing Aboriginal clothing since she was 13, and her work has been purchased by politicians and their spouses, including Aline Chrétien, wife of former prime minister Jean Chrétien. Many of the first ladies of North America, South America and Central America own the Sky Woman Cape. (Sophie Grégoire-Trudeau was also gifted a similar cape, in winter white.) Beauvais’ work is also popular with celebrities, including Robert De Niro, who owns a satin Tree of Peace Native Design vest, and Julia Roberts’ brother, actor Eric Roberts. Mentions that Keanu Reeves will be making some appearances in it, but the big news is a reteaming of Stomare and Eric Roberts!